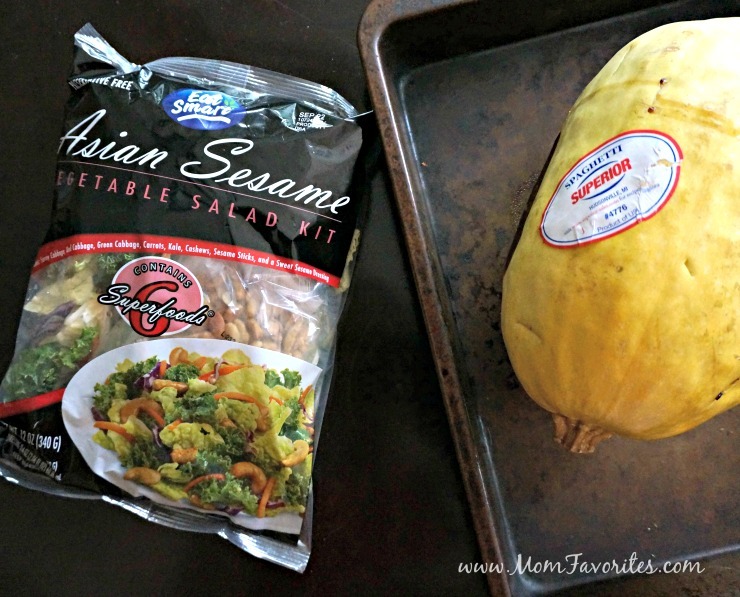 Warm Asian Salad with Eat Smart Gourmet Vegetable Kits + Giveaway! 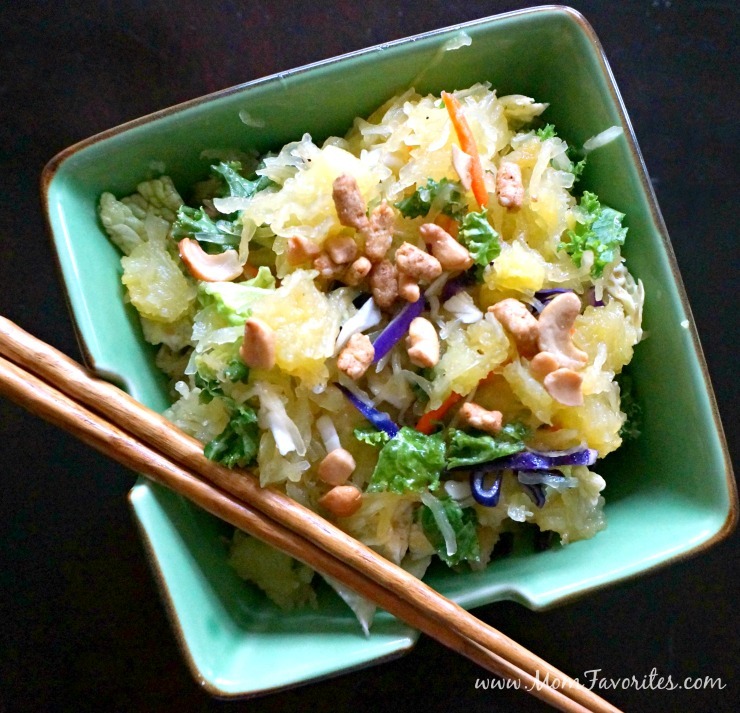 Make lunch exciting and healthy with this recipe for warm Asian salad using Eat Smart Gourmet Vegetable Kits. I love my salads. I’ve been eating a monstrous bowl of veggies for lunch all summer long. And, I’m not tiring of them yet. I’ve been mixing in different veggies and proteins, and keeping it interesting by trying new combos. As the weather starts to turn cooler, I’ll still be craving my bowl of veg… the only difference? I might start to heat things up. Lately, I’ve been experimenting by tossing warm spaghetti squash “noodles” with heartier fall greens and veggies. I’ve always been a HUGE fan of Eat Smart produce. Have you seen them in the supermarket? I always buy several bags of the pre-packaged fresh broccoli and stir fry mixes, and I love their Gourmet Vegetable Salad Kits, too. I now have several new salad options that are all to.die.for. 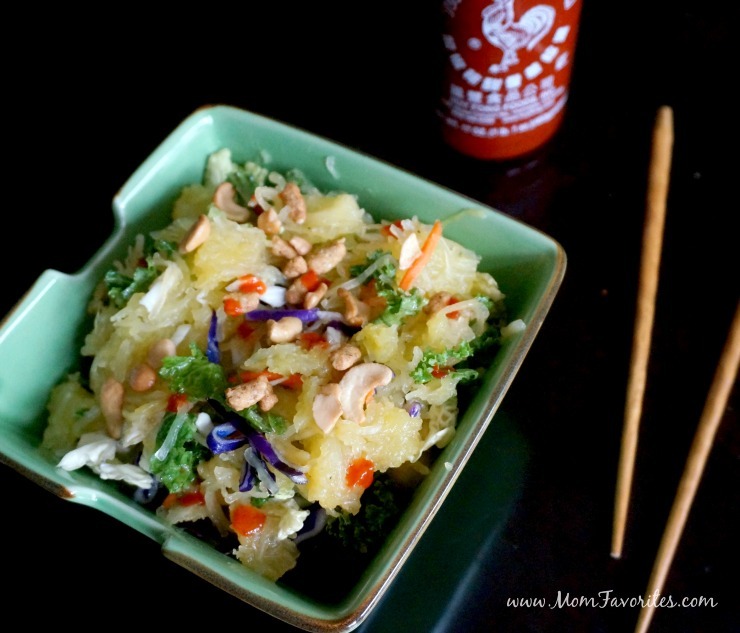 When in the mood for a warm salad for lunch, I start with the spaghetti squash. First, preheat your oven to 400 degrees. Remove from the oven to cool, until it can be easily handled. 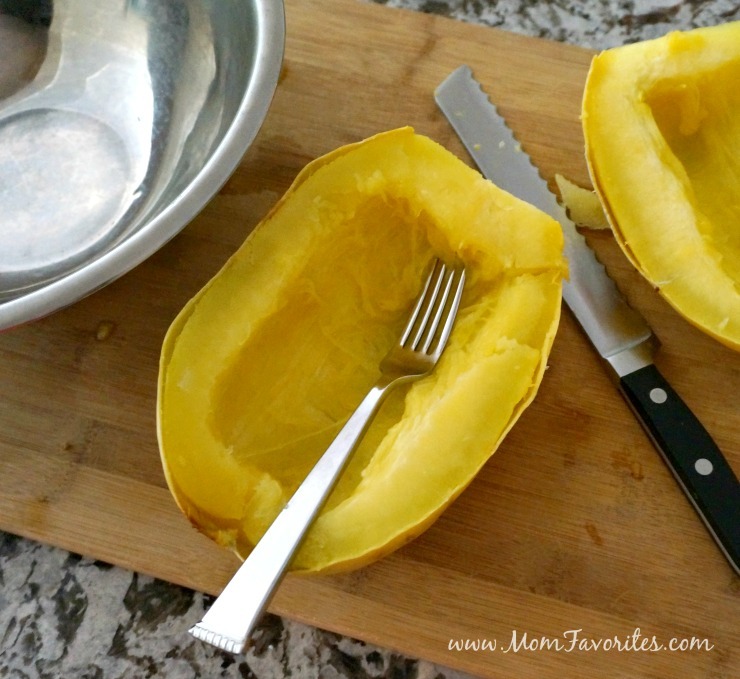 Slice open, lengthwise, then use a scissor to loosen the seedy threads from the squash. Scoop and toss the seeds. Pierce the squash with a fork or knife (being careful, remember, safety first! ), then place on a baking pan. Place in the oven, and roast until you can insert a knife easily through. A medium sized spaghetti squash will take about 40 minutes. 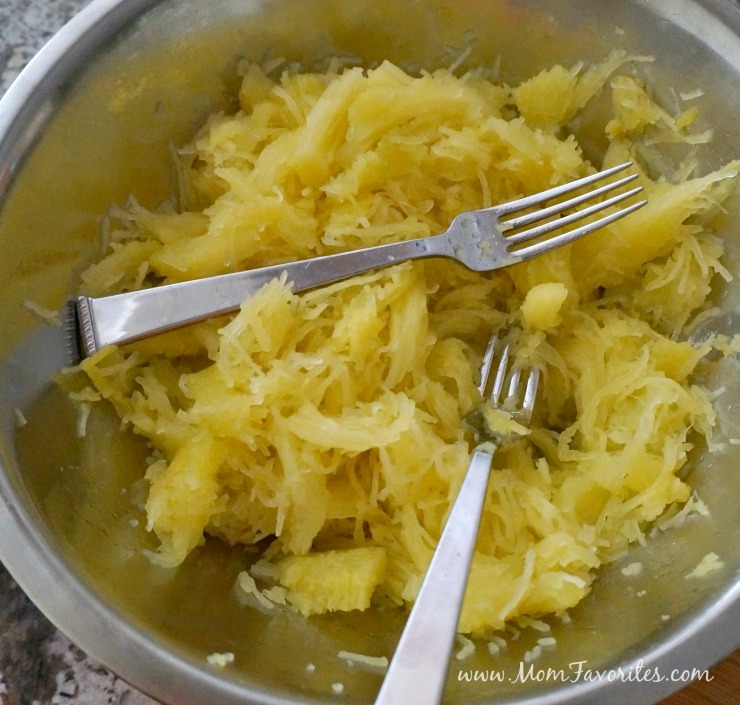 Then simply pull the strands of spaghetti squash out with a fork! You’re ready to go! 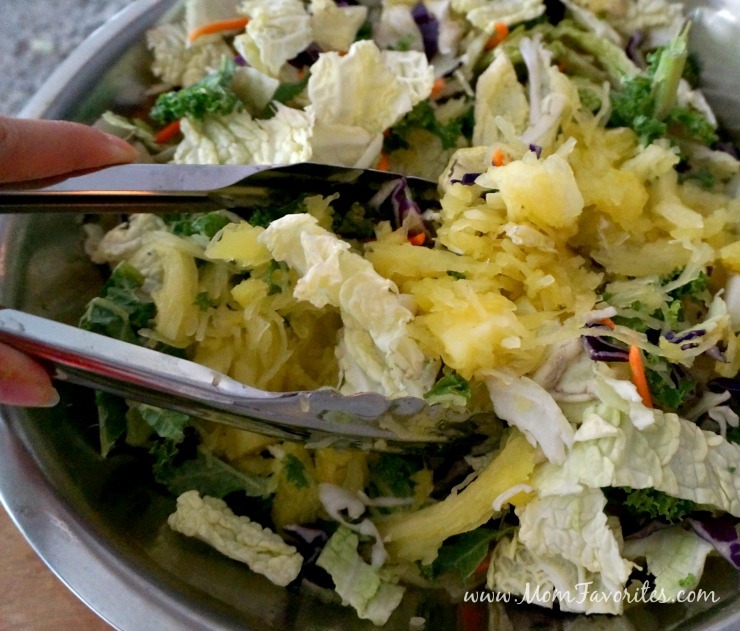 Now, it’s time to mix in your favorite Eat Smart Gourmet Vegetable Salad Kit. 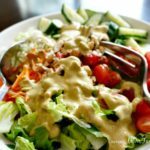 My fave is the Eat Smart Asian Sesame Vegetable Salad Kit, which combines six superfoods with crunchy bits and a sesame dressing. With savoy, red, and green cabbage, carrots and kale. 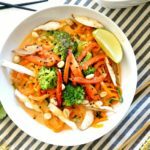 and cashews, sesame sticks and a sweet sesame dressing, this is the perfect combo to mix in with warm Spaghetti Squash noodles. 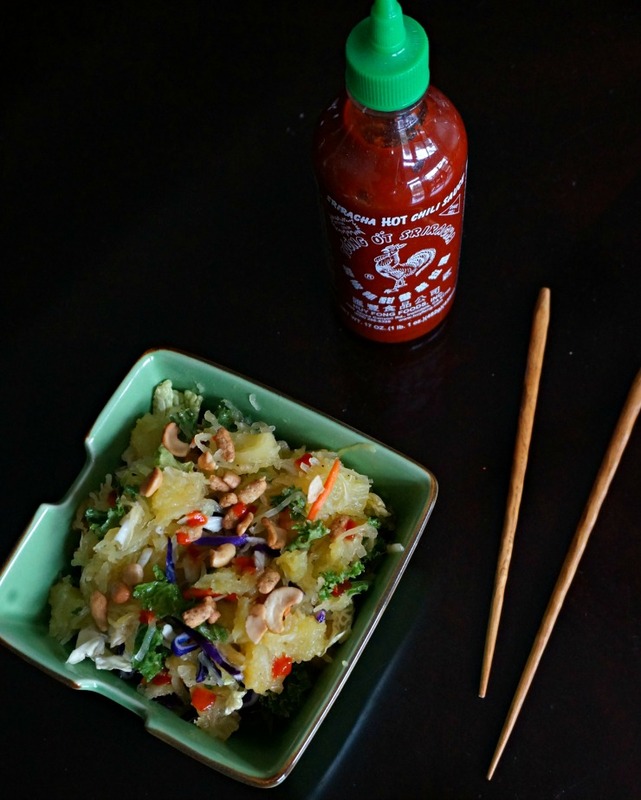 Topped with a little bit of Sriracha, you’ve got a lunch sure to fuel you through the rest of your day! 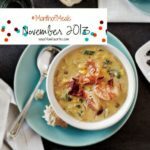 Have you tried the Eat Smart Gourmet Vegetable Kits? 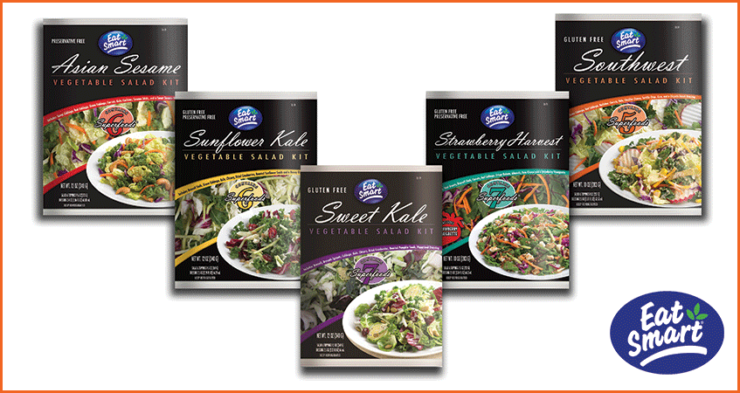 Be sure to try all five: Eat Smart Strawberry Harvest Vegetable Salad Kit, Sunflower Kale Vegetable Salad Kit, Asian Sesame Vegetable Salad Kit, Southwest Vegetable Salad Kit and the Sweet Kale Vegetable Salad Kit. Which kit are you most excited about? 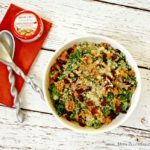 Be sure to check out Eat Smart on Facebook and sign up for their monthly e-newsletter for more salad inspiration and a chance to win a $50 AMEX Gift Card and samples of all five Eat Smart Gourmet Vegetable Salad Kits!